Harman Direct Positive Paper is traditional fibre based paper with a special ability. When exposed to the light -- in a camera or pinhole camera -- it forms a positive image. This behaviour is precisely the opposite to that of standard darkroom paper, and is a boon for anyone seeking to make direct prints without the need for a negative, paper or otherwise. I acquired a pack in 5x4” size last week and set about putting it through its paces. I worked in close proximity to the darkroom, which, as it turned out, was a sound decision. Moving from a still life setup to the darkroom and back again made getting a measure of the paper, of how it exposes, relatively easy. I made and corrected mistakes and began to see a glimpse of the delightful tonality the paper has to offer. Paper is much slower than film and this paper is no different, being approximately ISO 1-3. This makes for relatively long exposures in all but the brightest conditions. Pinhole photographers will be familiar with this way of working (pinholes being very small apertures in themselves resulting in long exposures), but anyone wishing to use the paper in a conventional large format (or other) camera will have to weigh up the extra exposure time against their pictorial intentions. Sharp portraits, for instance, could well be a challenge for the sitter. I resolved to test the paper in my trusty Intrepid Field Camera. My 150mm lens allows for relatively close focussing, albeit with significant bellows extension. The Intrepid was up to the task, and I was able to make the kind of floral composition I had in mind. The paper is luxuriously thick, as a baryta darkroom paper usually is, but this does provide a challenge to squeeze it into a film holder. At first I thought it might be a little too large in area, and so I trimmed the edges. This didn’t solve the issue, so the paper thickness certainly was to blame. Nevertheless it can be inserted with a little effort. Film holders are designed to hold film after all! After some initial mistakes I began to make some pleasing images. An error I did make was to use window light. This surely added to the quality of light in the images, but as the winter day darkened I began to chase exposure changes and so made some errors. It didn’t help that sky also brightened intermittently. A relatively high key image boasting a wide-ranging tonality, on Harman’s Direct Positive Paper. The image shown above is a good representative sample of what the paper can do. I see a paper capable of subtle shifts in tonality that retains excellent detail. The paper is said to produce images of generous contrast, but I wouldn’t discount it for a wide and subtle tonal range. There is something exciting about making a one-off, original image in this manner. For sure, this may be precisely the reason some won’t like it, but if you enjoy alternative processes I wager you will. I have waited some time to get hold of a box of this excellent product. Hopefully my getting hold of it means that it is becoming more available than it has been. If you’ve had your eye on it and haven’t so far been able to get any, now might be the time to look again. I don’t think you’ll be disappointed. The Intrepid 10x8 Field Camera in use. 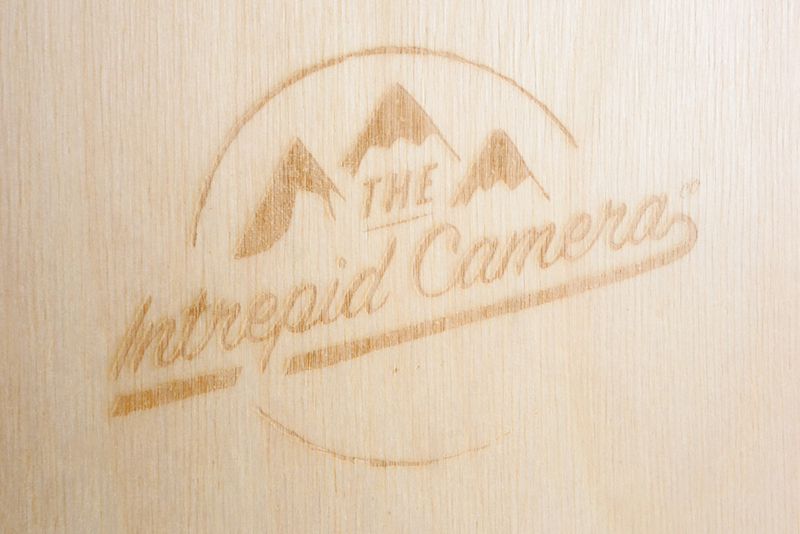 I can remember my excitement when I first saw the Intrepid 10x8 Field Camera on Kickstarter. I was already very familiar with Intrepid’s 5x4 model (see my review earlier in this blog), so I felt like I knew what to expect. Yet this wasn’t 5x4, it was no ‘small’ format, it was 10x8! I started to dream of 10x8 contact prints, and felt like a little boy wishing for Christmas. It was a camera I had to have. I duly paid my Kickstarter pledge and waited for the camera to arrive. When it came, I was immediately struck by its size. The size of cameras is of course relative, as in all things, and what may be considered large by one person in one context can be quite small in another. The 5x4 model was still fresh in my mind and hands, and it was this that began to look positively miniature by comparison. The 10x8 was a big piece of wood. It’s worth pursuing this notion of ‘largeness’, because it plays into operational considerations of weight and bulk. It’s an aspect that properly belongs in a review written for the would-be purchaser, such as this one. The front standard with Intrepid's own lens board and logo detail. On the ground glass is a beautiful etched logo. Someone has given a great deal of thought and love to this camera. The logo on the base of the camera (with suggested destination). There are those who are wary of plywood as the primary material, but I can’t say that I am one. There is a context here, which is the existing market for traditionally-made 10x8 cameras. There are some truly beautiful models out there, usually constructed from woods that would not be out of place in high quality furniture. These are highly precise, hand crafted cameras that last a very long time (witness the large format second-hand market). They also come at a premium. 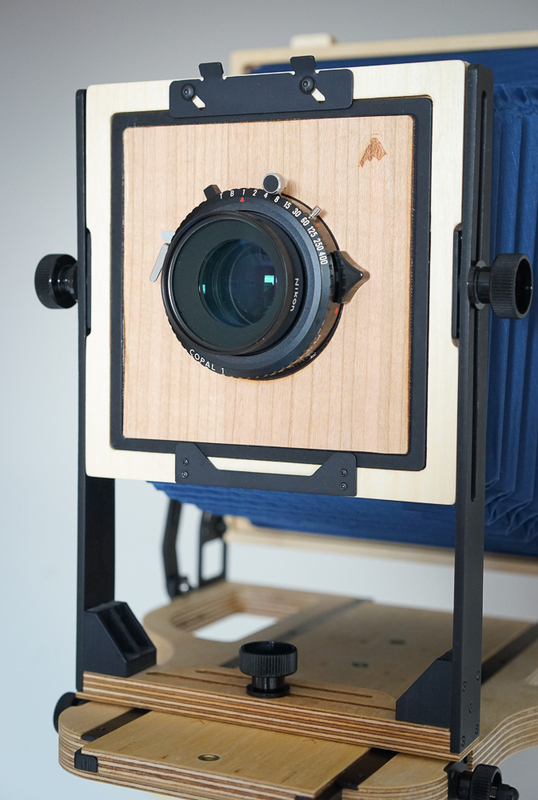 The raison d'ȇtre for the Intrepid large format models is affordable and lightweight. I have used my 5x4 quite extensively and see no deterioration in the wood. 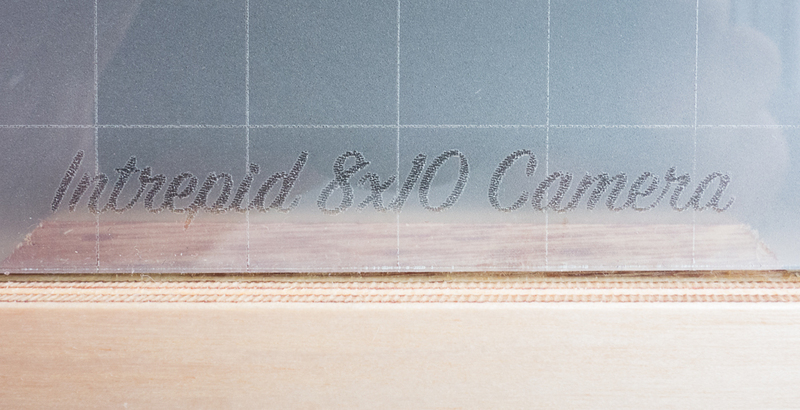 I therefore have no reason to think there will be issues with the plywood on my 10x8 in the near future. Long-term may be a different question, but you will see I refer my thinking to the important context. The camera from the front, in the field. Operationally, the 10x8 Intrepid is very similar to the 5x4. The camera folds to something like an 8 cm deep, one foot square for transportation. It therefore needs to be unfolded and the front and rear standards tightened into place when in use. This can be done quite quickly, and I found the 10x8 no longer to set up than the 5x4. The lens board is inserted in a similar manner, and the mechanism for holding it (a metal part with two screws) the same. Focus is by means of a knob underneath the front standard, and a parallel knob allows the lens to be secured in place once focus has been achieved. The camera folded up. You can also see the small but useful spirit level. There is one important difference however, and this is a product of the design of ground glass and film holder receptacle. When the camera is first unpacked, the ground glass is in portrait orientation. In the 5x4 model it can simply be turned into landscape mode, a very convenient feature made possible by clever design and the miracle of magnets. Magnets are still present in the 10x8 version, but now the user must unscrew the back, take it off, and screw it back on in the alternative orientation. The rear of the camera in portrait orientation, with film holder inserted. When I first looked at this I thought the design was elegant enough and didn’t pay it too much attention. I must say that having used it for a time in the field, it isn’t quite as smooth as I’d like. On my copy of the camera, some fiddling is required to marry the screws to their receiving holes. Not a big issue, but for someone like myself who likes to change from portrait to landscape frequently, a small hurdle to very smooth operation. Indeed, when I first used the camera I tended to forget that the back needed to be returned to the portrait orientation before the camera can be collapsed. You can’t close it if the back is left in landscape mode. A quirk that you learn for sure, but worthy of mention here. A close up of the screw mechanism used to change the orientation of the ground glass. Not all 10x8 cameras can change orientation (i.e. some are fixed in either portrait or landscape), so there is an upside to this design, too. The critical reviewer of cameras sometimes treads a fine line, especially with something like this wooden camera where there may be variations between samples. I only have the one camera, paid for by my own money, and so the reader should be warned that some of what I write may apply only to my specific example. At any rate, I know that Intrepid are extremely receptive to feedback and already have a sound track record for improving their products (the 5x4 is currently on its third iteration). I write in the spirit of critical feedback and ongoing improvement. When I first received my camera, the focusing was not very smooth. I applied a little extra machine grease to the mechanism and ‘exercised’ it a few times to loosen it up. There is no doubt that it works fine (because I have tested it in the field), but I do still have the impression of the teeth ‘missing’, at certain points, as the focus is turned. Perhaps there is scope to add more precise metal parts to this area, which does have to move a large section of wood (by contrast the 5x4 moves a very small panel and the plastic parts have no problem at all in providing a very smooth operation). When I made my first exposure I realised I had a light leak. At first I thought it was an issue in the darkroom, but then it struck me that the shape on my negative pointed to light inside the camera. A quick check with a torch in total darkness confirmed what I suspected, and I resolved the problem with a little glue on the bellows. I have had no light leaks since, but the incident taught me early on to check for leaks before any substantial expeditions. This is an element of good practice with large format, although Intrepid may wish to give thought in the long-run to how their bellows are attached. Perhaps a mechanism other than glue will exceed the brief and price-point of the camera, I don’t know. Again it’s worth stressing that I’m writing about my copy and other Intrepids may not see this issue. It is important to scrutinise the camera, but now I must write of pleasures. Of the pleasures of 10x8 as a format and of using this simple, wonderful camera that looks good on the eye and even smells pleasant! There was more to my desire to shoot 10x8 than camera envy, or a wish for capricious change; I have long wanted to shoot 10x8 so that I could make contact prints. Readers of this blog will be familiar with my obsessions with the print, and indeed with the aesthetics of film, so what could be more attractive for me than the promise of a film format that could potentially deliver prints of the very highest order. The joyous sight of a 10x8 contact print in the wash. This review has been some time in the making because I wanted to spend time with the camera - and to spend time printing and actually making work. This I have done, and so I feel like I can write with some sound experience and insight. I have had a lot to learn beginning 10x8, and have learnt a lot. I don’t want to go too much into this here, because the danger is I will stray into writing about the format rather than the camera. However, some points are relevant, again because they speak to Intrepid’s brief and what I consider to be their success. One of my 10x8 negatives receiving wetting agent. If you are reading this review you may well have some sense of what might be required with 10x8, even if you have not yet tried it. 10x8 demands a commitment in planning, journeying, and physically carrying gear that other formats do not, and tolerates nothing less than impeccable craft. These are the source of its frustrations and its joys. When it is good, it is really good. Other than price, and therefore accessibility, the chief selling point of the Intrepid is its weight of 2.15 kg. A Chamonix 810V weighs 4.3 kg. (Although in fairness, they do produce a lightweight model, still heavier than the Intrepid at 2.46 kg.) I spent a long time searching for an appropriate bag / backpack (and my solution is worthy of review in its own right), but suffice it to say a good solution weighs 2kg itself. This makes a pack of roughly 4kg in weight with only a ‘standard’ focal length lens inside, and a large tripod to carry. As someone interested in landscape images, I have to wonder whether I could take 10x8 images at all with a traditional camera model. At any rate, some physical training and a re-evaluation of my sedentary ways may be in order. The Intrepid packed away and ready for adventure. When the Intrepid was first released there was a fair amount of discussion about its stability or lack thereof. I haven’t used the camera in any particularly challenging conditions, but I have made moderately long exposures outside and with some wind. My negatives show no evidence of camera shake. The front standard is very secure on my copy, and indeed I hadn’t thought to question its stability until I read the discussions. Perhaps for some users accustomed to heavier equipment, or who have need for longer exposures in adverse conditions, this may be more of a concern than it was to me. I am happy to report that I have made technically sound negatives with the camera, something on which I have been able to build (with no small excitement) in the darkroom. The 10x8 format is well suited to the revealing the details of this majestic tree. Unfortunately this negative betrays an early processing mistake I made: witness the line down the right hand side from too-even tray agitation. When I began printing, I had in mind the old adage that the harder the format is to shoot, the easier it is to print. There is a certain amount of truth in this, although I have come to look somewhat suspiciously on the oft touted idea that contact printing is more straightforward than conventional enlargement. You can see where the logic lies: gone is the enlarging stage, with its limitations of lens quality and potential dust contamination. Perhaps it is the legend of Edward Weston making beautiful prints with nothing more than a contact print maker and a humble bulb that prevails. In point of fact, I encountered several technical issues, dodging and burning can be quite a challenge on the scale and with the room afforded, dust still accrues, and my desire to make a borderless image on a larger sheet of paper necessitated hours of difficult trials with different masking solutions. My Fallen Tree image on Ilford's sumptuous Multigrade Art darkroom paper. A version on fibre based warmtone paper is available in my shop at the time of writing. Yet doubtless is the generous tonality and sheer visibility of the 10x8 negative. The Intrepid is a joy to compose and focus with, thanks to its bright and clear screen (limited however, it should be pointed, out by the maximum aperture of your lens). I felt I was much more in control of my image than I was with my 5x4 camera, simply because the flickering camera obscura projection is that much smaller on 5x4. This sense of control was magnified throughout the whole process: spot metering felt clearer and more decisive (I apply zone system control in processing for single images), negative inspection was a joy. I made but one studio portrait to see how the camera would function there, and the same advantages were apparent. I expect they would become even clearer with further use in the studio setting. Hillside Tree, Somerset, Ilford HP5+ in LC29 developer. I write this review today at a time when my 10x8 work has really started to get going. I have shared images made with the camera on social media and offered my first 10x8 darkroom print for sale on my website. I am thoroughly embroiled with this imperious format and it is in no small part thanks to the existence of Intrepid’s camera. Whether or not you have the money and inclination to buy a 10x8 Intrepid is of course your decision. Finances, circumstances and needs vary. Is the camera ‘affordable’ in the context of the large format camera market? Absolutely. Does the camera function properly and promise a proportional and sensible period of service to an industrious photographer. Without question. Is it a ‘way into’ 10x8 that I can recommend? Without hesitation. The critical comments I have made herein are in the spirit of improvement. I offer my support to Intrepid because I like what they are trying to do and have benefited from their products in my own photography. The challenges of making affordable equipment in traditional photographic markets should not be underestimated. Witness Intrepid’s own attempts, and for the time being failure, to make a complementary affordable film holder. To paraphrase Intrepid themselves, here the company has discovered that there is a reason why some photographic equipment is traditionally so expensive. They simply couldn’t engineer a working holder at the price they envisaged. I wouldn’t bet against them one day succeeding with the film holders. For now we have a fabulous camera and new photographic adventures to enjoy. I have to say, thanks to the Intrepid 10x8 Field Camera, this little boy’s Christmas has well and truly come early. Fallen Tree. A 10 x8 contact print made on warmtone fibre based darkroom paper. As part of my ongoing work with my 10x8 camera, I'm happy to offer for sale 'Fallen Tree' as a darkroom print. I have made a very limited number of contact prints from the 10 x 8 negative, on Ilford's Warmtone Fibre Based paper. The image size is a little smaller than 10 x8, and the paper size is nearly 11 x 14 inches. This allows the print to be mounted with a paper border showing, should the buyer wish. As always, the screen image fails to do the print justice, which really needs to be seen in person to be fully appreciated. Today I'd like to share a video with you. I have been working on my 10x8 contact prints and am starting to get some sound results. The print in the video is approximately 11 x 14 inches, with the image size just a shade under 10x8 inches (I used a mask to get the paper white edges and this results in a size slightly smaller than the negative). As always it's difficult to truly share a print online, but I hope the video gives a sense of its physicality and presence. I said in a previous post that making this print has been a bigger challenge than I anticipated (mainly because of the masking), but working with the large negative has been a joy. The adventure continues. The Intrepid 10x8 Field Camera, with Intrepid lens board. As the sun beams down here in a positively Mediterranean England, it’s time to update you on my latest adventures in large format. Having taken possession of my lovely new Intrepid 10x8 camera (you may have seen my unboxing video in an earlier post), I’ve been steadily working away, and I’m now beginning to see some pleasing results. I have been on several shoots, mainly in the beautiful wooded environs of Cannock Chase in Staffordshire. I’ve also spent a lot of time in darkroom, both developing and printing. Some things about 10x8 are already familiar to me, such as camera craft and exposure, and I’ve been happy to continue to practise those. Indeed, I’m enjoying the very precise control that shooting one (large) sheet of film at a time brings. My spot meter is happy to get an outing. The lush young ferns of Cannock Chase, Staffordshire. Not everything has been straightforward (I had the same experience with 5x4, so that’s no surprise), and I’ve been learning at every stage. 10x8 is even more demanding than 5x4 physically (you carry more), and if image management is important in 5x4, it is at least as important, if not more so, with 10x8. The old wisdom says that as the formats gets bigger it’s harder to shoot but easier to print. There’s something in this, and certainly interpreting the tones in big 10x8 contact prints has been a joy. Contact printing itself has, however, not been an easy process. I am starting to see why some darkroom workers still project a 10x8 negative, even to make a 10x8 print. It’s actually a slow and cumbersome process that poses some challenges whilst dodging and burning. The results are steadily appearing however, so I’m still optimistic and excited. The rear of the Intrepid, showing the back in landscape position and with film holder inserted. So what of the Intrepid 10x8 camera? I’d like to write a detailed report in the near future, so forgive me for being a little coy for now. Suffice it to say it has already produced some technically excellent negatives and has not let me down in the field (actually, there was one exception to that, on which I will say more later). The second shot I made was a studio portrait. I wanted to test the camera in a studio situation too (much as I did with the 5x4 version). This was the first negative that revealed the sheer magic of 10x8 for me, although as I’m suggesting, more have followed. I’m going to keep shooting and printing, so as ever I’m working towards the best prints I can make. Watch this space for some new work, as well as that review on the impressive Intrepid Field Camera. I have been looking forward to printing this negative for some time. The print is on warmtone fibre based paper (hence the gentle curl at the edges). I began with my usual procedure of making test strips at grade 2.5, but soon went down the grades as I felt that the negative demanded an open and gentle tonality. The grade I used in the end was 1.4. There is a very extensive tonal range, and the print does not lack contrast, even at this low grade. I think I achieved the kind of open tonality I was after. The print size is a little larger than I would normally print at for 35mm. It was made using my Zeiss C Sonnar 50mm lens, and the bright, strongly backlit scene allowed for a favourable aperture and shutter speed combination (favourable, that is, to securing the necessary sharpness for a good enlargement). A fibre based print being washed. I've been working with students in the darkroom all through this week. One of the things we've been trying out is prints 10x8 inches or larger (we normally work with a smaller size, especially for beginners). I always enjoy demonstrating printing; I think it's really important for students to see an instructor engaged with the process, leading by practical example. The print above is on fibre based paper. It's a work print, ready for a little contemplation before a final dodge and burn plan is made (I think it will be mainly burning-in with this image). There's always a sense of anticipation as the print dances and the water flows. Don't forget 'dry down' though: tones become a little darker when dry, which can often steal a little of the perceived sparkle of the lighter tones. A fine product from Ilford and a mainstay of many darkrooms in this country is Multigrade IV Resin Coated paper. It’s the paper I use most with my students and it comfortably facilitates a novice’s first steps towards a satisfying print. Not all darkroom papers are equal however, and if you have begun your darkroom journey with a paper such as this, you may wish to consider trying a warmtone paper too. For me, warmtone is my paper of choice, and you will often come across advice to make the switch to it on grounds of an improvement in quality. Now, I’m not sure it is objectively ‘better’, nor do I quite agree with the advice I sometimes see that it will give you a ‘better’ tonal range (as if merely making the switch is enough to ensure printing contentment). What it does give you is a different distribution of tones at different grades, and, with the right negative, this may well result in a more satisfying and expansive tonal range. I know it does for me in the vast majority of cases. Multigrade IV has a very long reach into the highlights at middle grades, while it is somewhat lacking in local contrast in the midtones. If your negative has a lot of midtones, this can result in a muddy and disappointing rendering. Multigrade IV Warmtone on the other hand, has much more ‘punch’ and tonal separation in the midtones, albeit at the expensive of the highlight scale. It gravitates towards a crisp white in the highlights quicker than its cousin, and this may not be an issue in the case of the midtone dominated scene. As is so often the case in photography, this is a question of compromise, or more accurately, of the right compromise for your particular equipment and visualisation. It is good darkroom practice to know the tonal characteristics of your paper and to match them to your negative. In reality one paper may very well suffice for the majority of your printing, but if you haven’t tried any alternatives, how do you know? It may be time to try the warmtone option, and to see how it works with your negatives and vision. The fruits of my recent 5x4 labours: a small but magical contact print. The tonal range is impressive for a straight print. Paper is Multigrade Art 300, which explains the textured surface. Film is Delta 100 developed in Perceptol. In the last post I wrote of my frustrations with 5x4 in my early use, and stated my belief in the ‘possible satisfactions’ of the format. To put matters bluntly, there’s simply no point in persisting with a format if those satisfactions can’t be acquired. At stake is a considerable investment in time and money, and, worse still, one’s efforts as a photographer. Why invest in a format if it doesn’t enable you to realise your vision, or at least a sizeable part of it? Having developed and contact printed some negatives this week, I’ve been able to reflect on those ‘satisfactions’ and to provide some evidence to myself of the value in persisting with 5x4. Along with, ‘do I see those satisfactions’, I’ve also asked myself ‘what exactly are they’? I’ve answered yes to the first question and ‘I’m not sure’ to the second. It’s the ‘not sure’ that’s the point of this post. Two qualities apparent in the contact prints that I would expect in see in my 5x4 work are sharp details and a wide, appetising, tonal range. Indeed, this may be the nub of it, and there may in fact be nothing more to say. It is, after all, customary to admire the detail and enlarge-ability of large format. Yet there is that something more, a peculiar combination of elements; certainly tone and sharpness, but also the extensive rendering of fine details, a grandiose air, a certain look derived from focal length and the 5x4 format, a specific kind of depth of field, an expansive and airy tonal modulation across the image, leading the eye on a journey from centre to periphery and back again. It’s very hard to say what exactly, but I suspect it comes from the peculiar possession and combination of these elements. A ‘magic’ (for want of a better term) of the medium and the satisfactions it gives in translating the world we see with our eyes. Photography is a representation or simulation of the visual world, and it seems to me that 5x4 has a peculiar excess of detail that our everyday vision (with its blurred periphery and constant scanning movements) lacks. It’s not just the ability of a large negative to render fine detail, but also the extensive depth of field that can be achieved with small apertures in combination with camera movements, that conspire to make this excess possible. It’s a physical feature of the medium I’m sure (my ‘magic’ is not metaphysical), but one I struggle to define precisely. Given a little more work and attention to the medium as I go, I may reach such a description in the future. Have I glimpsed enough magic to continue undeterred (at least for now)? The answer in the affirmative has been given above. It’s nothing more than a sketch, but it is a start. Another sample is added to the Pebble Project Galleries. This time it's the turn of Ilfotec HC, used on FP4+. Looks to have a nice open tonality, holding the highlights well. Grain is quite evident, but sharpness is not lacking either. If you've followed this series this far, I thank you for your patience and hope you'll find something of interest in today's post. I plan to do one final post after this, a collection of practical exercises to help improve your command of tone. If you are tuning-in to this series for the first time, this post will make sense on its own, but I would recommend checking out the preceding ones in order to get the most out of it. I turn my attention now to providing some examples, in order to show what ‘recipes’ of tone are available. The images are taken from my own practice; however I should add that the history of photography is brimming with examples from numerous different schools. We might think of Bill Brandt and the English School, the endless greys of Paul Strand’s Palladium prints, or the rich and varied tones of Group f/64. A histogram is a graph showing the distribution of tones. The horizontal axis represents the different tones available, running from pure black on the left to pure white on the right. The vertical axis represents the quantity of pixels in the image it maps, so that the peaks indicate dominant tones. The benefit of a histogram is that it helps you to visualise tonal distribution without being fooled by the image itself. This particular histogram broadly backs up what I said about wide-ranging tone, but you will see that there is more to the story. More accurately, the peak on the left shows the image to be rich in shadow tones; on the right we see a smaller, but also significant, group of light tones. The histogram ‘crashes’ with the left hand side, showing that pure blacks are present, but is still a little way off white on the right. The lightest tones are therefore ‘nearly white’. We might therefore speak of an image that has a goodly tonal range in shadow areas and in the very light greys through the arch. The tonal approach or strategy in this image is to have a largely light image with a smattering of punctuating dark tones. The eye is therefore drawn to the darker areas, which in this case helps to support the inferred narrative. We can see that the very dark tones are not quite black (although the seem like it to our eye), likewise there are very light greys and only tiny amounts of white. The majority of the tones are over to the right, as we would expect given our description. I am not a photographer who favours high contrast images, and I in fact struggled to find good examples from my archive. I gave this image a little extra contrast in order to provide the illustration here. Such an approach is a very graphic style which favours bold shapes and outlines. In film photography, high contrast leads to pronounced grain and is often associated with low light work with fast films, or average speed films that have been ‘pushed’ in development (exposed at a higher ISO than box speed, with compensated development to avoid negatives which are too thin). As I searched for images I begin to wonder about my own photographic style and why I had made such little use of graphic contrast. Such thinking leads to interesting questions about habits and assumptions and whether we are not missing out on creative possibilities. Naturally, there is no rule that says one must be using all established approaches to tone in one’s work (life would be very dull if we all did). Yet I think there is a job of reflection that we can do given a knowledge of how tone works and what we haven’t tried. To paraphrase a master printer I admire, how do we know we don’t like the alternative if we haven’t tried it? This recipe entails exposing for patches of light tone in very high contrast situations. It is very fashionable at the time of writing. The photographer typically applies negative exposure compensation and allows the shadow areas to lose definition. It is like the high contrast approach above, inasmuch as it can be very graphical, but the crucial difference is that the favoured areas still potentially contain a wide tonal range. It is used mainly by street photographers and has the clear benefit of helping to establish areas of interest and narrative interaction. The photographer can make frames within the images, sometimes multiple ones, which connect and juxtapose the chance elements of the street. My final formula is one much exploited in the history of photography, and that is of a fulsome range of greys. The idea here is to have midtones that reach outwards such that a harmonious scale of differentiated tone is apparent. The photographer tries to maximise tonal information, downplaying, but not eschewing, the extremities, whilst maintaining tonal transition and modulation. Black and white aren't entirely absent, but they do not present themselves as much as in the 'wide tonal range' recipe with which we began. The histogram for tree image above shows abundant midtones invading the space to the sides. There is a huge amount of tonal information here and the photographer has to take care not to let the image appear too muddy. Platinum / Palladium prints are notorious for providing a tonal recipe like this. The don't exactly lack contrast, and certainly not tonal differentiation in a good print, but the scale of grey just seems to go on and on. I don't think it's an accident that the example I've chosen from my own practice comes from a 5x4 negative. Large format has an inherent ability to capture smooth tonal transitions, in no small part due to the sheer size of the negative and the information captured. Tones still need to be managed, of course, through exposure, developer choice and development and dodging and burning, but the photographer is in a strong position to achieve the effect to begin with. My example was shot on Ilford Delta 100 Professional film and developed in LC29. Delta 100 is extremely fine grained in large format, and LC29 gives wholesome contrast without becoming overpowering. With a negative like this, one can dodge and burn gently to tease out distinct areas of tone, emphasising the range at one's disposal and avoiding 'muddiness'. Indeed, avoiding a mass of undifferentiated tone is the key challenge in pursuing expansive greys. With such prevalent midtones it is easy to lose a grip of contrast. An image of expansive greys still needs to be tuned with gentle modulations of tone to provide a story and a journey for the eye. Too many similar tones will quickly repel the eye and return a feeling of flatness. The photographer must find subtly and tonal richness without relying on more familiar devices of contrast and distinction. As with so many different photographic media and techniques you can't have it all ways and have to work within the set of compromises you have chosen. I own a print by an established photographer that is framed and displayed in my home. I enjoy this print every day, and it has many virtues. Shot with a large format camera on black and white film, it has a rich tonal range, is pin sharp, beautifully mounted, and is of an uplifting natural scene. The tones are undulating and varied without being brash or overly contrasty. The scene is peaceful and there is a quiet drama to the print that chimes with this. As a printer however, there is one detail that really excites me. To the top left of the image is a space where foliage gives way to a glimpse of distant mountains. I have never seen the negative, so I can only speculate about what it is actually like, but I imagine that particular area to be pretty dense. I surmise that a straight print would result in a too light patch that would draw the eye undesirably to the edge of the frame (and thus from the image area and its subject matter). I further surmise that a little burning-in is necessary to bring a sense of solidity to the rocks and to shift the tones from empty white or near white to light grey. A light grey that is solid but still light. A grey delicately balanced and finely tuned. How satisfying that light yet solid grey is! To my eye, with my printer’s speculation (admittedly a projection, but likely, I think), it is a small but hugely important detail that makes all the difference. It encapsulates for me the joy of the printer’s work; the ability to tune parts of an image such that the whole becomes greater than the sum of the parts. The work of greys, of patches and pockets of grey, decided upon by the artist. Not arrived at accidentally, but tuned with intention, decided upon, meant. A most delectable patch of grey, and a reminder of what a great monochrome medium we have at our disposal, film or digital. Two big* negatives in the drying cabinet can only mean that my new large format adventure has begun. An exciting sight this week, and, perhaps, the start of a whole new aspect to my photographic work. I somewhat improvised the development procedure - time was certainly against me - but the negatives are basically sound (maybe a tad underexposed). So far in this series I have given a general introduction to tone (in black and white photography), and have introduced the idea of using exposure to gain creative control over general tone and mood. It's well worth looking over the previous two posts if you are new to the series. In this instalment, I turn my attention to the concept of contrast and introduce the idea of local adjustment of tone. Contrast is nothing more or less than how tone is distributed in a photograph. In high contrast images, it is the extreme ends of the scale that dominate. Low and high zones, or shadows and highlights, are evident at the expense of midtones. Conversely, in low contrast images it is the midtones that dominate, the more extreme zones being largely absent. A more typical scenario is a scene containing a wide range of tones, and therefore more moderate contrast. Life for photographers isn’t always easy, and when thinking about contrast we have to keep an eye on how our materials effect contrast as well as the contrast from the original scene photographed. My wall example (see post 2) is straightforward in the sense that it is low in contrast. However, as we have already hinted at by looking at some different exposures, it can be rendered in different ways depending on our use of the medium. Indeed it shows a classic problem in black and white, which is that white things will usually be rendered grey unless we do something about it using our technique. ‘Overall’ contrast (or more properly ‘global’ contrast) isn’t the whole story when it comes to manipulating tone, as we shall see, but for many practical reasons it is an appropriate place to start. In addition to exposure, film development, paper choice (including the contrast grades), software processing and even viewing distance affect contrast (try observing how contrast increases the further away you get from a photograph on a wall). Each of these areas is a subject deserving treatment in its own right, but some examples will give us a taste of the choices that need to be made. Films interact differently with different developers and this affects contrast. How the developing tank is handled (agitated) effects contrast, as does development time (extending development gives more contrast, cutting it less). Papers have different ‘grades’ corresponding to the high, low or average contrast set out above (with ratings going from 00 to 5). Some darkroom workers still use papers with ‘built in’ grades, however the majority now use ‘multigrade’ paper capable of rendering all the grades through the use of filters. Papers also have intrinsic leanings to different distributions of tone, some have more midtone contrast, others more contrast in the highlights, and even paper developer can be mixed at different strengths to increase or reduce contrast. Different image processing packages put their own stamp on how images are initially processed and the contrast that results. RAW developers offer a staggering amount of precise control over tone, printer drivers can affect contrast, as again does paper, this time in the inkjet world. A series of reference prints from a step wedge. These show the differing tones a given paper has to offer at different grades. They can be a real boon to a darkroom worker. Not only are there lots of factors influencing contrast, they also work subtlely in tandem. A given paper can only print a given negative, in which a series of decisions about contrast has already been made. The same is true with digital processing, although thanks to developments in technology, it is increasingly the case that image files can have their contrast adjusted significantly in post-processing (without any penalty for poor or inattentive exposure technique). This takes us to the question of the original scene again, still a big issue for film photographers. A ‘typical’ scene, let’s say one including sky and land on a bright day, will contain a tonal range that comfortably outstrips film’s ability to record it. This means in practice that a photographer must decide where to place the exposure, and compensate for the problems through development and printing. This forms the basis of the zone system mentioned previously. The photographer exposes to achieve adequate detail in the shadows and then controls the highlights by reducing or extending development times. We have now established two substantial ways that we can take control and determine the tones in our photograph: exposure and materials / technique. Control is the aim, ultimately, for we cannot ‘play’ our tones if we cannot purposefully manipulate them. The remaining method at our disposal is the altering of individual areas in the photo, traditionally known as dodging and burning. 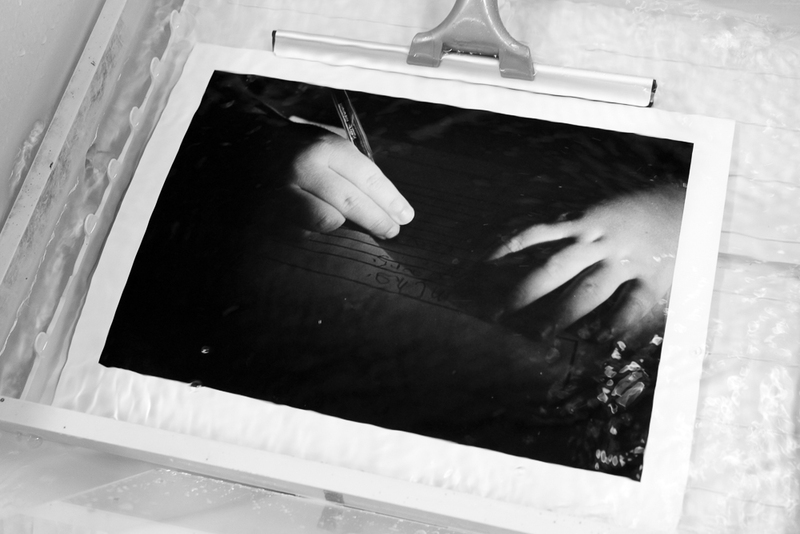 A darkroom worker dodges, or shields, areas of paper as a print exposure is made in order to create lighter tones. Burning-in is the opposite, in which tone is added to a distinct region using further exposure and a piece of card with a hole in it (or more simply the printer’s hands, shaped to make a hole for the light). The language of the wet darkroom was adopted by software, and hence we have dodging and burning tools in digital processing too. The methods for altering individual areas of tone are now numerous: as well as the aforementioned tools themselves, we have masks and levels adjustments, adjustment brushes in RAW processors, layer styles and layer masks, control points, the list goes on. 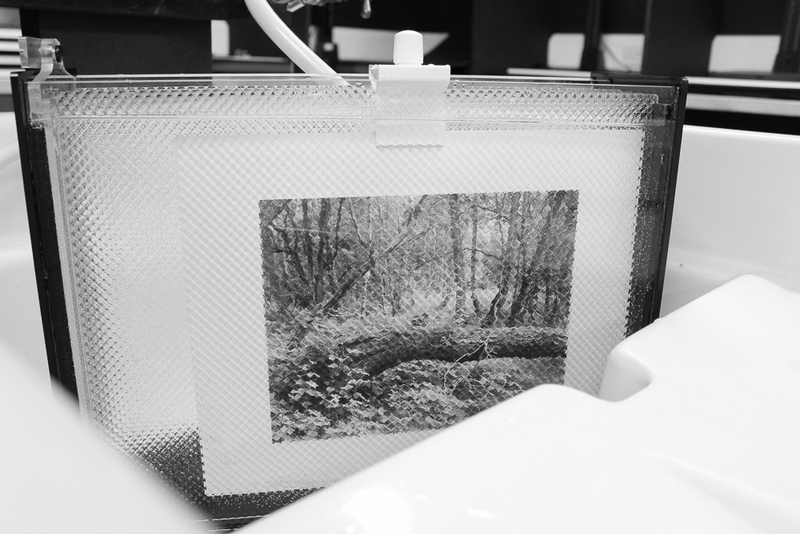 Increasingly, an analogue print from the traditional darkroom feels like a handmade ‘event’, which cannot precisely be repeated, whereas the digital darkroom is all about absolute precision and repeatability. I really enjoy how I can revisit a print in software, making very fine adjustments as I progress the work. I find myself working somewhat differently in the darkroom to the digital realm because of this. In my experience, a modest amount of dodging and burning is all that is usually needed to turn a ‘good’ image into something much more special. The challenge is to be able to determine what an image needs, and to make adjustments without over-doing them. That said, it is often surprising just how far we can alter the tones of an image before the eye begins to protest and it looks unrealistic. Assuming that halos or other obvious signs of intervention aren’t produced, our minds will accept quite extreme tonal combinations, at least in black and white photography. I am not new to large format photography strictly speaking, for I have dabbled from time to time before. I am, however, largely a small format photographer, with the particular way of working that entails. I decided recently to begin some 5x4 work in earnest, a desire which coincided with my discovery of the super light and keenly priced Intrepid camera. The title to this post thus describes a modest new chapter in my photography and an opportunity to share some of my experiences here. I hope there will be some value in this to anyone starting out in large format, or at least wondering what it is all about. Watch this space for progress reports and a little review of the Intrepid. It is certainly looking rather handsome with its red bellows; I hope it performs as well as it looks. Every year when working with my students in the darkroom, I try to encourage a thought process that is as receptive to unintended results as intended ones. This is not always an easy endeavour, and it occurred to me this year that I lack a clear label for the kind of approach I want them to take. Quite often, what I mean becomes evident only when it is found. We speak a lot about planning in education (we live in a ‘target’ driven world it seems), but not so much about the pleasure of the unplanned, of what one discovers through doing, even when one wasn’t looking for it. On one happy day when one of my students had the unplanned event revelation, I at last came up with a satisfactory term: ‘serendipity’. Now, before I unpack the term a little (and I will not insult your intelligence; insert ‘happy accident’ and you have my gist), I will add some photographic seasoning with a specific darkroom reference. In his book Black and White Photography Workshop, master printer John Blakemore tells the story of how he came to work on a new series of especially pale prints. On the day in question, he had intended to do something quite different, but, on realising he lacked the supplies he needed to print in his ordinary manner, set himself the challenge of printing his negative as pale as possible. You can (and should) check the results out yourself, for they are quite exquisite. A fortuitous set of circumstances that led to an unexpected path, a new way of working. So, finally to serendipity. The term was coined in 1754 by Horace Walpole. He recounted the tale of the ‘Three Princes of Serendip’ who ‘were always making discoveries, by accidents and sagacity, of things they were not in quest of’. This could almost be a darkroom mantra! Be open to those discoveries, gained by accident or sagacity (or, we might say, ignorance), of results you weren’t after, but might rather like. An awareness of serendipity shouldn’t be limited to just darkroom, of course. I wonder how many other aspects of our photography work would benefit from a little of these ‘things we were not in quest of’? By way of a nod to the festive season, may I present this modest (but significant) print offer. I am offering for sale a limited edition of just ten darkroom prints of my 35mm photograph Rain Lanterns. The prints are approximately 9x6 inches, on Ilford’s superlative Multigrade Art 300 paper. This is an archival material that will therefore last for many, many years if properly cared for. It has an eggshell, slightly pitted surface and beautiful tonality. The offer is significant because it is the first time I have made a darkroom print available for sale. Prints will be signed and numbered on the reverse, and will come with a certificate of authenticity. The certificates will bear an Ilford authentic fine art print label. I will not print any more of this edition (designated 2016), although I may choose to make future editions (these will be labelled appropriately, so that the current, and first, edition will be identifiable). If you are ordering in the UK and do so before the 18th December, I will make every effort to ensure you get your print before Christmas. For orders outside the UK, please make them as soon as possible if you are looking for Christmas delivery. Due the nature of international postage, I can’t guarantee a pre-Christmas delivery, but I will ensure prints go out as soon as possible at my end. Postage is free for the UK, and there is a £10.00 charge per order for all other destinations. Darkroom prints of my first Pebble Project film / developer test negatives. Film is FP4+. Today I bring you a little update of my Pebble Project in the form of some darkroom prints. I have printed the first four FP4+ negatives from the project (results shared in the previous Pebble post) on Ilford Multigrade Resin Coated Gloss paper. I will share these in a larger and more accessible form in a future post, but for now they read: LC29 top left, Perceptol top right, Ilfosol S bottom left, DDX bottom right (with development times as per the previous post). The darkroom prints make the differences more obvious, and, on a cursory look, I felt they were somewhat more in keeping with what I'd initially expected from the different developers. No surprise here, as negatives are obviously designed to be printed in the darkroom and my expectations (and data such as that from Ilford) were shaped there. I have more technical information to share on this (such as my darkroom printing decisions) and some more observations and corrections. The project is not at all straightforward - and certainly has its limitations - but I am learning a lot which is great. I am working on a little gallery of results for this site, which will enable the reader access to all the Pebble images in one place and to view larger versions. I'll publish this in the near future and add to it with more film / developer combinations as things progress. Watch this space. In this instalment of Pebble Project I present four examples of FP4+ in different developers. In a sense, the results here speak for themselves and the reader is invited to draw his / her own conclusions. That said, I’d like share a little commentary of my own as guidance, especially for the reader who is less experienced in film use. This is a job of interpretation, and as such carries the usual caveat that your impressions may differ. You will see immediately that different developers have differing effects on similarly exposed film shots (which these are). This phenomenon is a big part of the joy film, its flexibility and potential to be shaped as the user wishes. There are different areas which we could focus on in interpreting the results. I made a list, and then printed the images so I could do a little table-top assessment. I decided to make things interesting by hiding the developers from myself (easy enough, given the degree of similarity of the shots), therefore doing a roughly ‘blind’ test. First I asked myself about sharpness. I went backwards and forwards, and then backwards and forwards. I didn’t feel confident that I had reached a clear conclusion on this. On the one hand, this points to just how close some these developers come, on the other it might point to unaccounted for variables (like focus variation). I had, as it turns out, settled on the Perceptol sample as the ‘sharpest’, followed by LC29 and Ilfosol S together, with DDX last. I had firmly expected Ilfosol S to be the sharpest, given my experience of using this developer with Delta 100. Ilford don’t list Perceptol as being noted for sharpness. I don’t think DDX is generally known for sharpness, so it is perhaps not a surprise that I rate this last. Next I tackled fine grain. I regarded DDX as the best (i.e. least grainy), followed by Ilfosol and Perceptol together, and LC29 last or ‘most grainy’. We’re not dealing with grain like golf balls here, far from it, but this is also not Delta 100 grain, which I consider to be finer. I think this conclusion is in keeping with what Ilford would say. My next category was longest tonal range. I accept that this might be skewed by exposure issues (see notes below). My impression was that the longest march from deep tones to still palpable light ones went to Perceptol and LC29 together. Ilfosol I placed after, with DDX last, insomuch as it has a mid to light tonal range in which the extremities of tone don’t feature. Put differently, we could say DDX has a very open tonality. Ilford say that DDX provides the best overall image quality for liquid developers with FP4+. Perhaps this open tonality figures for them. I then thought about the most open shadows, having in mind landscapes and other such images where blocked up shadows are a problem. I have hinted at my impression, namely that DDX has the most open shadows, followed by Ilfosol, Perceptol and LC29 in that order. Ilfosol sits in my mental map as something of a contrasty developer, and so I was a little surprised by this, and might have expected Perceptol to figure more highly. DDX gives a speed increase, so this again may account for the more generously exposed darker tones. The quickest to lose the highlights I saw as clearly Ilfosol, although I am not sure I can usefully distinguish between the others. This is more in keeping with my own impression of Ilfosol as a sharpness enhancing developer that be difficult to print if the shots were made in high contrast light (I am referring to 35mm, somewhat loosely metered and metered from experience, rather than a careful zone system style placement and development regime). FP4+ has a ‘shoulder’ on its contrast curve, and so should deliver very manageable highlights. My results do nothing to contradict this. Lastly, I thought about mid tone contrast. I went with LC29 and Perceptol together first (i.e. most mid tone contrast), followed by Ilfosol and then DDX. I have used LC29 a lot with HP5 plus and am used to seeing good negatives with plenty of contrast. I have always thought of Perceptol as rather smooth, but my experience is mainly with HP5 plus. What does this mean so far? Well, if there is any objectivity here (I hope there is some), then I have seen that some very well established ideas about FP4+ and its developers have been confirmed. I have also had some of my assumptions challenged, and, for me, this would now have an impact on my shooting and developing choices. I haven’t shot very much FP4+ in the grand scheme of things and am already beginning to cook up some uses. I must acknowledge that looking at studio test shots is not the same as looking at a contact print of ‘real’ images. The alchemy of film aside, these results do provide me some food for thought, and I hope this instalment offers you something useful too. There are more developers to try with FP4+. These I will add to the start made above. I think it is right to compare other similar speed films, and Delta 100 is the obvious candidate, which I shall move on to next. Another legitimate option is to compare different speed films in the same developer. I may do this relatively quickly too, because it might prove more accessible to those who have not shot too much film. A beginner might quite rightly ask, if I buy one bottle of developer, which films might I explore for different conditions? I have started with a relatively arcane scenario by taking one film and comparing it to itself differently developed. Watch this space. I was looking at gloss inkjet prints, made on an Epson P600 machine, using Epson’s Advanced Black and White print driver. The print medium and driver play their part in the results. I was conscious of some differences between print and screen, as I would expect. Were darkroom prints to be made from the original negatives (here scanned on a Nikon Coolscan machine), the paper and development choices would be an influencing factor too. There is no ‘actual’ negative, other than, well, the actual negative! When we print, with combine parts that work on one another. Where I am citing Ilford I am referring to relevant datasheets. These are excellent and provide lots of useful information that anyone interested in these matters should consult. My development times are ‘standard’ (and convenient) ones given by Ilford. I have not used any ‘exotic’ variations, for example greater dilution and stand development. I reason that the Ilford times and dilutions make a great baseline should other recipes be explored. There are many such recipes in the film using community, and often these are cherished and highly personal. I gave the Perceptol sample twice the exposure, given that it is a speed reducing developer. DDX is known as a speed-enhancing developer, and thus the sample is consistent with the idea that it should be a little ‘faster’, seen here as lighter tones. I did not alter the exposure for the DDX sample.